360 GAME presents ROAD FC 026 will take place in Seoul, South Korea at the Jangchung Gymnasium on Hangeul Day, 9 October, 2015. The Unification of the Flyweight title between Jo Nam-Jin and Song Min-Jong will finally take place. Inaugural Flyweight Champion Jo Nam-Jin is one of Korea’s most celebrated and promising young prospects. He began his professional MMA career at just 16 years of age and his formative years were spent in international competition. In Sengoku, Legend FC and Shooto, Jo faced some of the best in Asia. Jo finally made his return to fighting in Korea at ROAD FC 014 when he made the drop to Flyweight and defeated Shooto Champion Mikihito Yamagami. Interim Champion Song Min-Jong is an equally promising prospect who spent the beginning of his career facing the best fighters and surmounting the ranks in ROAD FC and beyond. Song got his first taste of a title when he beat both Alan Yoshihiro and current Bantamweight Champion Lee Yun-Jun in the Bantamweight Tournament of 2013. Therefore, he made the finals against Lee Kil-Woo, and a brutal, swift and very close match ended in disappointment with the split decision awarded to Lee. Song was determined to rebound and he defeated UFC veteran Issei Tamura in his next outing. Therefore, with both top ROAD FC fighters making the transition to Flyweight, Jo faced Song for the Inaugural Flyweight Title match at ROAD FC 016. It was an action-packed style versus style match, and Jo narrowly secured the Split Decision to win the belt. Song delivered such a close and excellent performance that he inevitably received the right to be Jo’s first Title Challenger. The rematch was ordered to take place at ROAD FC 021, however a serious injury forced Jo from defending his title for some period of time. An Interim Title Match was decided, and Song was matched against HEAT and DEEP standout Takeshi Kasugai. In a bout that was called into overtime, Song was successful in capturing the interim Flyweight Belt. Finally, Jo and Song will meet to unify the ROAD FC Flyweight Title. At ROAD FC 026 on 9 October, the two best Flyweights in all of Korea will meet to determine who is the king of the ROAD FC Flyweight division! 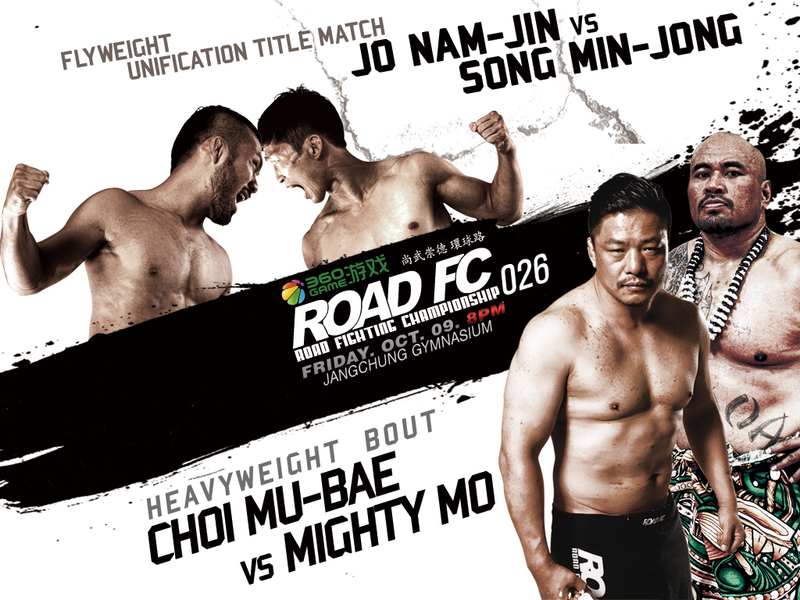 As previously announced, Korean Mixed Martial Arts legend and Champion Greco-Roman wrestler Choi Mu-Bae will finally match K-1 wrecking machine and Bellator veteran “Mighty Mo” Siala-Mou Siliga at ROAD FC 026. Choi and Mighty Mo were originally scheduled to fight in K-1 Dynamite!! USA back in 2007. Now, they will finally face off in a battle of legendary heavyweights! This match promises to make for another exciting finish in the quickly developing Heavyweight division of ROAD FC!